Music will show you what to do with your life. other students in these groups, and in positions of leadership. Senior students take leadership roles AS Music Leaders within each of our performing groups. Itinerant Music Lessons are available during school time. At WGC we offer orchestra, concert and big band, barbershop, and 3 different choirs. 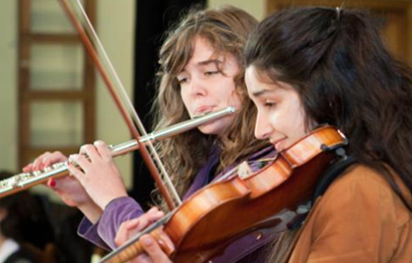 Some of our departmental performing groups are run in combination with our brother school, Wellington College, and all are directed by staff, or experienced musicians from outside the school. We are represented annually at The Big Sing, WeBO (Wellington Band and Orchestra Festival), the Barbershop Competition, and the Tauranga and Manawatu Jazz Festivals, and run our own concerts and open rehearsals each term. WGC students are regularly also members of NZSSC, NZSSSO, Sacred Heart Cathedral Scholars, Wellington Youth Orchestra and the Wellington City Concert Band, and our singer/songwriters have more recently begun to feature in Smokefree Rockquest. Year 12 and 13 students can apply to be Music Leaders, and appointments are made at the beginning of each year. There are opportunities within each of the performing groups and also some administrative roles.